The new print/copy/scan system went live on 12th August in Stirling and will go live Tuesday 13th August in Highland. 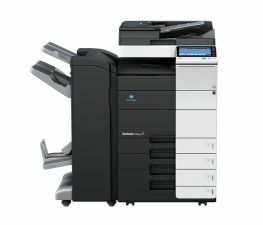 The new machines are all able to print in colour and mono (black), print A4 and A3 jobs and also print stapled jobs. The queues are listed on our student print web page. The old print server alvie has been retired and a new server called \\studentprint\ now holds all of the print queues. If you are using your own laptop to print, you’ll need to connect to CampusNet, then in the Start>Search box, type the name of the queue you want to print to eg \\studentprint\twosided. Your laptop will then download the driver needed and you should be able to send print jobs to the new system. The student lab PCs have all been updated to print to the new printers. In Stirling the student ID cards need to be ‘associated’ with the system at the machine in order to use the card reader on the side of the machine. The instructions are either taped to the machine or beside the machine. When the instructions are followed correctly a message will appear that says the ID card has been associated with the system. If this message does not appear the most likely reason is that you have probably pressed login on the screen after typing your password. What one should do is to type their user name and password in, press OK and STOP. Then one should present their card to the card reader at the right hand side of the machine. This will have the desired effect of ‘associating ‘ one’s card with the system. You will only have to do this the very first time you use the system – thereafter you can just touch your ID card to the reader to logon. To LOGOUT – press ACCESS button on the right of the touchscreen TWICE. Other instructions on how to use the machines are taped to the machines. Account balances from the old system will be moved to the new system on Tuesday evening. Until then all students will have their free allocation of £6. The easiest way to logon to the Moneyloaders is to use the card reader. To do this it is best to ‘associate’ your card with the new printer/copier/scanners before going to the Moneyloader. Please note advice above.